Outstanding craftsmanship of embellishments exhibited in this grey net designer saree. 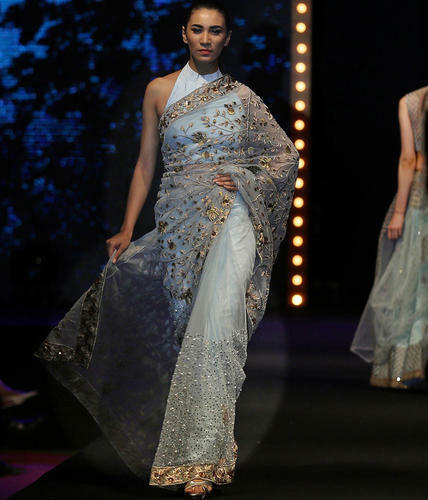 The interesting pearl work & sequins work & resham work all through the attire is awe inspiring. Comes with matching blouse. Footed in the year 2007, Shree Exports is a notable business firm affianced in the sphere of manufacturing, supplying, wholesaling and exporting a comprehensive range of garments comprising Georgette Ladies Suits, Lehenga Choli, Ladies Churidar Suits, Party wear Saree, Designer Saree, Traditional Saree, Evening Gowns, Fancy Suits, Casual Saree, Anarkali Suits, Velvet Pant Style Suit, Bridal Saree, Ladies Suits and Branded Sarees. These products are crafted underneath stern supervision of skillful executives by making use of modernized machinery which is purchased from specialized sellers of the market. To add, the whole consignment is accessible in a variety of packing and design provisions as per our customers’ varying requisites. To preserve their trust, the final assortment is well-reviewed on a number of grounds before delivery. Moreover, these are rigorously reviewed before getting shipped at the destination of our patrons.